We examine end-user license agreements and flag any unusual restrictions. Fonts with licenses that cover the common uses designers expect earn our Worry-Free badge, providing you with a simpler licensing experience. What Makes a License Worry-Free? Script fonts are evocative of cursive handwriting, and often have sweeping strokes and connecting letterforms. Scripts can cover a wide range of styles from formal to casual. Check out our most popular scripts below. Need a license for unlimited usage, a special use case, or one with additonal terms? Fontspring works with you to create a custom license that fits your exact needs. Fontspring supports fast moving teams by getting you access to fonts licensed with your own custom terms as quick as possible so your team can get back to designing. Call or email us and get fast and friendly help from our font licensing expert. He’s assisted many Fortune 500 companies with custom font licensing and is ready to work with you too! Pay once for any license and use the font forever. We trust our customers to use fonts properly and don’t burden you with performance and privacy-crushing tracking scripts. Our prices fairly compensate foundries without penalizing large companies. We support several payment methods including invoicing, wire transfer, and checks. A major auto brand needed to use our fonts anywhere, while remaining license-compliant. We delivered an all-inclusive license that gave them complete design freedom and peace of mind. Talk about the ultimate worry-free license! A client approached us wanting to give her customers the ability to design and customize their own products with our fonts. Only an email or two later, and she’s in business! Fontspring was established on the idea of creating a fair marketplace for type designers and font buyers. We call our commitment to a fair deal and the practical steps we’ve taken to achieve it our “Fair Fonts” commitment. Foundries should be fairly compensated for their work. We pay foundries 70% of every sale, the highest rate in the industry. A healthy font marketplace is important. We promote quality fonts over steeply discounted ones that exacerbate a race-to-the-bottom. We value long-term relationships with foundries but don’t lock them into a participation agreement, leaving them in control. We partner with 625 world-class foundries to sell exceptional fonts that have all the care and detail our customers have come to love and expect—all with simple licensing. Our monthly email newsletter features great new fonts, spectacular font deals, and interesting articles from the type world. Social media more of your thing? Follow us and be the first to know about hot new fonts being added, blog posts we’ve written and other related news from Fontspring. There is nothing that increases the quality of a design more than a premium typeface. 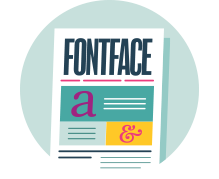 Buy fonts from Fontspring and experience the difference of a Worry-Free licensing experience.